While globalization has made it possible to sell products and services to consumers around the world, marketing methods remain diverse. 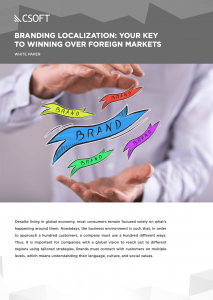 When it comes to global branding and messaging, the one-size-fits-all approach of many American and European-based companies may not deliver the results you’re hoping to achieve. Because consumer behavior varies depending on location, it’s imperative to have emotional and intellectual insight into local brand positioning and messaging across all channels of communication. To ensure messaging resonates, CSOFT brings together a robust group of market-specific cultural strategists, experienced translators, industry-specific experts, and creative professionals skilled at working within specific regions and across linguistic and cultural barriers. With unmatched resources on the ground and unrivaled expertise in globalization and cross-border communication solutions, we guide our clients’ brands and products beyond familiar markets with linguistic and cultural savvy. By masterfully targeting the unique consumer psychology and preferences of local audiences, clients who partner with CSOFT are able to build worldwide brand recognition and loyalty more quickly and effectively. From initial strategy to creative conception, copywriting, and design, we deliver localized content that speaks to consumers in meaningful ways, wherever they are. Whether it’s corporate branding, marketing communications, public and investor relations, or Social Media efforts, CSOFT’s proven experts will guide your worldwide marketing and branding campaigns in ways that improve brand awareness and spur sales. Let CSOFT break down linguistic and cultural barriers so your business can thrive around the world. How did DJI become the “Apple of drones”? With its latest portable Mavic 2 drone released in Aug 2018, DJI has proved its dominance in the consumer drone market once again. As Casey Neistat, one of the most famous YouTubers, said on his latest review of the new drone, ‘DJI with its two latest releases, once again shows that when it’s time to buy a drone, it’s not ‘do you buy a DJI drone’, it’s just ‘which DJI drone do you buy’ ‘. It is important for companies with a global vision to reach out to different regions using tailored strategies. Brands must connect with customers on multiple levels, which means understanding their language, culture, and social values.